There is an ongoing and urgent need to improve education, livelihoods, health, and the cohesion of families and communities in rural areas worldwide. The development community has increasingly recognized that local solutions to social and economic problems have more enduring impact than those imposed by international aid groups with minimal community buy-in. But what approaches are effective and sustainable? This case study presents READ Global’s model for sustained rural community development, how the model works in practice, and the outcomes it produces. Lessons learned from this study can be applied to other contexts to reduce isolation of rural communities while enhancing their capacity to lead social and economic transformation. READ Global has been partnering with rural villages in Nepal, India, and Bhutan for 25 years to establish community library and resource centers (READ Centers). All READ Centers are owned and operated by the local community. Each center has a library, computer room, women's section, children's room, and training hall. The centers connect with local partners to offer training in education, economic empowerment, technology, and women's empowerment. Each READ Center includes a for-profit "sustaining enterprise"—a small business that creates local jobs and generates profit to support the ongoing costs of the center. Sustaining enterprises range from tractor rental services and agricultural cooperatives to community radio stations and sewing cooperatives. There are more than 100 self-sustaining READ Centers in Nepal, India, and Bhutan, and no center has closed since the first center opened in 1991. 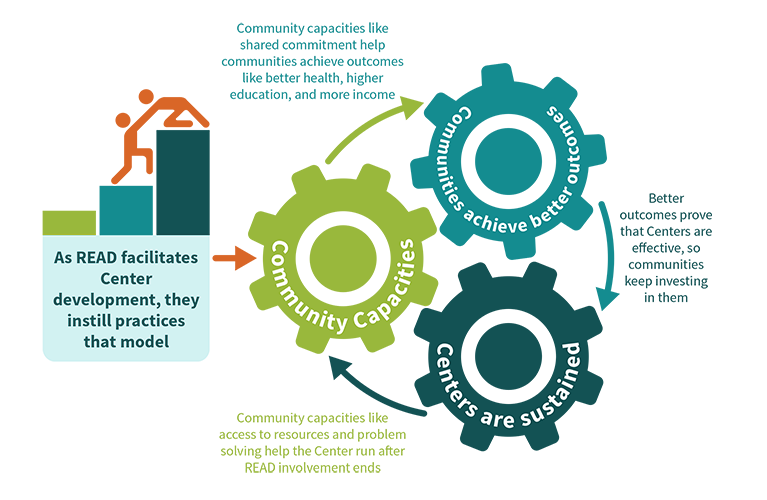 The combination of these key elements appears to put READ Centers on a course toward generating the range of community development outcomes that have been documented by an external evaluation and ongoing program monitoring and evaluation efforts. Based on our study of READ Centers in Nepal, we believe there is much to be learned for development efforts more broadly in focusing efforts on building community capacity, then transitioning to applying these capacities for desired outcomes that in turn are driven by the communities themselves.